Simple and Simplify are mantras for me. As I sift through details and information, looking to make meaning, I think of them to uncover what matters most and identify the simplest core idea with which to simplify and organize complexity. 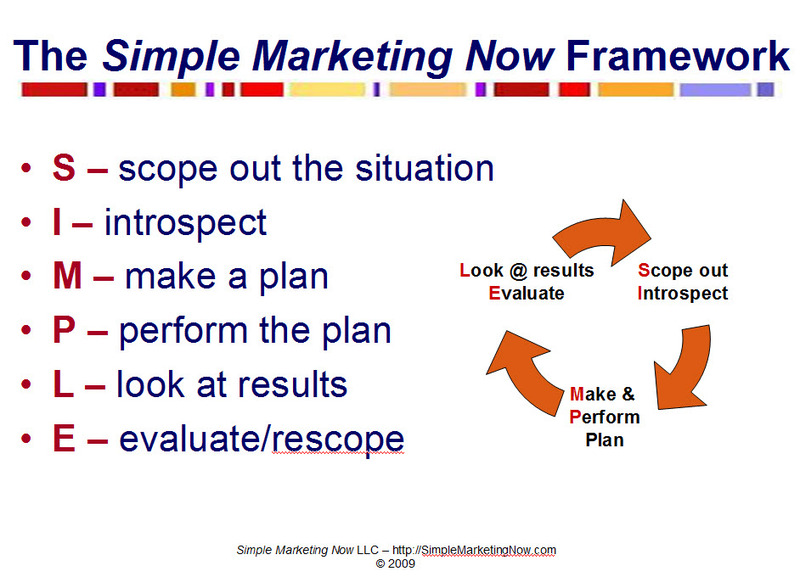 For that reason, I created a Simple Marketing Now framework based on 'SIMPLE'. I refer to it on my website. I describe it to you here. S = scope out the situation. Scope out the situation refers to exploring the marketplace and assessing what I refer to as 'digital visibility': can you be found online? Who are your customers? What are they looking for? What issues do they have? What are their conversations about? What other options do they have? What are your competitors doing? What are you doing offline? How do offline and online integrate? This stage is about grounding yourself in what truly matters to your customers and listening to them. 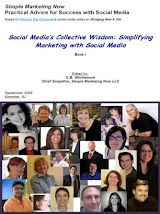 Because, if you want to connect with your customers, you want to understand their world and engage them in conversation as Lisa Petrilli explains in Why You Must Rethink Your Marketing. The truth resides in the marketplace, not in our organization, not in our products, but rather with potential users. The more attention we pay to them, the better the insights and the greater the opportunity to successfully connect. Introspect is how I characterize the analysis stage. Given the insights I've gathered while scoping out the situation, how does what I do add value to potential customers in my marketplace? What do I stand for? How do my strengths match up with the needs I've identified? What about my weaknesses and potential threats? How might I deal with those? How committed am I to customers? Simplifying plays an important role at this stage. So does honesty. Perform the plan is just that, put into action the elements of the plan you have developed. Make sure you pay attention to details. Look at results at regular intervals, both short-term and long-term. What patterns emerge? Any surprises? Evaluate and re-scope. Tweak, improve and add more relevance as you gain additional context and perspective so you can start the process over again. Note how I group them together: Scope out and Introspect; Make a plan and Perform a plan; Look at results and Evaluate/Re-scope. 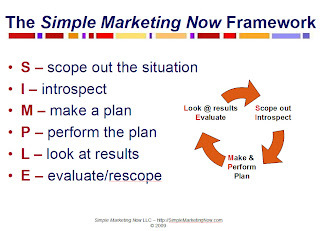 What do you think of the SIMPLE Marketing Now Framework? What would you add to it? I can't thank you enough for including my post in your insights - it means so much to me that you find value enough in the post to share it with your clients and readers! I love that your framework focuses on simplicity. I think many marketers feel overwhelmed right now by what they perceive as great complexity in the marketplace driven by new tools and new terms and uncertainty. Your focus on getting back to basics and simplifying the process will be an oasis and source of clear insight. It's a terrific writeup of an amazing experience and I'm grateful you were there to witness a Fire Session in person. Thanks for sharing it with us. Thanks, too, for endorsing my simple framework. As overwhelmed as we feel now, something tells me it will only get more intense - which means we have to focus on the basics and understand what matters. It's the only way to navigate and make sense of the rich chaos.